My grandfather’s aunt was one of Bucharest’s first two gynaecologists. She studied in Paris. Back home, she married an orthopaedist who taught at the University and was appointed as a doctor at the Royal Court of Romania. They built themselves one of the most beautiful villas in the Capital city: 12 rooms. Their hallways and staircase were covered with paintings by highly-rated Romanian painter Nicolae Grigorescu. They frequently held balls attended by the high society and people from the Royal Court. They had four servants, a Rolls Royce with driver waiting by the entrance and a farm with over 120 acres of land. This was shortly after 1900. Besides her profession, my aunt also did abortions. After she ceased working in a public hospital, she opened a private practice where she continued to do abortions. Her assistant died after many serious diseases, which kept her paralyzed in bed for nine years so the relatives needed to call a few priests to hold the rite of Holy Unction at home for her. She suffered a lot. The aunt, who worshipped her husband, had to endure the fact that she could not have children. With all their wealth, they felt poor. Her husband suddenly fell ill with a cancer and died after two years. Nobody could help him. They were both doctors. The aunt became anxious while the communist regime confiscated her wealth. She was able to live on the money made from selling the things in her house. Her second-degree nephew, the only direct heir after her, who was also my father, and the extended family, pushed my mother to have three abortions. He eventually developed a mental disorder which prevented him from having a job after he turned 40. My brother, just after he let his friend have an abortion, developed another undiagnosed mental condition and became unable to work after the age of 30. I developed a debilitating disease myself, which left me disabled when I was 16. At the third generation, none of us can have children and probably our bloodline ends here. As wealthy as our family was in the 1900s, here we are in 2016, when those who have had abortions in our family are going through material hardships difficult to imagine. God has helped me and my husband support their basic necessities, as they have absolutely no means to earn their living. And we can only witness the terrible strife they produce within our family because their mental condition, but there is nothing we can do about it. We have only suffered in silence for years. The aunt passed away at 84 years of age. By then, she had withdrawn from society. After her husband died, she spent decades reading alone in her armchair. She suffered enormously after she lost him. She realized the evil produced by abortion. She sold all the valuables she still had and paid for the painting of many churches, deeply regretting her deeds. She died peacefully, without suffering, by a heart attack. The apartment where she had her private practice was sold to a couple. The wife would not have children and she aborted all of her babies. As soon as she turned 40, she developed breast cancer, had many operations and then turned schizophrenic. She suffered a lot before her death. The state demolished that apartment and things got even more complicated. The inheritors have not been able to this day to get their hands on the compensation money from the state and they are now living in poverty and need. I personally haven’t had any abortion, nor have I ever taken the morning-after pill. 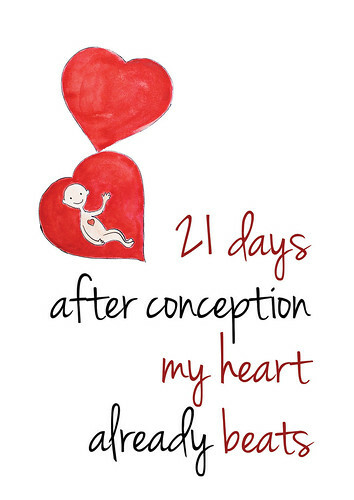 I have never taken any such pills – these are usually either abortive right away or lead to abortion on the long term. Yet, I have been quite traumatized by abortion. I can feel those children’s suffering. I pray a lot for my family members and for the killed babies. I also manage a Facebook page about abortion. In two-three years since I have established it, I managed to send by mail approximately 100 of those black booklets published by Editura Bizantină publishing house with The Prayer or Canon for Aborted Children. Only 100. Even though Romania has seen millions of abortions. If those who have had abortions – both mothers and fathers – prayed, lit candles and did some charitable deeds for those souls, our youth would not take this issue so easily. And we would have an education from one generation to another. Unfortunately, it is not so. Parents refuse to talk about this subject to their children and one cannot approach them, as they remain confined within themselves. I don’t know whether we have in Bucharest a memorial of the unborn children, as other countries have. It’s a pity we don’t have a day dedicated to their memory and to the fight against abortion.